Baton Rouge is the capital of the state of Louisiana and as many know it is home to the Fighting Tigers of LSU! However, there are a few lesser known facts about the city that many people don’t know. 1. When filled to capacity, Tiger Stadium is the 5th largest “city” in the state! 2. 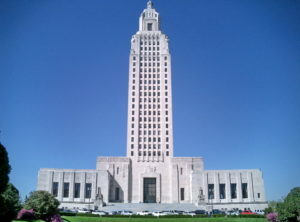 Baton Rouge currently has the tallest State Capitol building in the country! The Louisiana State Capitol is just shy of 450 feet tall! 3. Baton Rouge has the most lawyer advertising (and lawyers) per capita than any other state. Take a quick cruise down the interstate and you will find this is no surprise here! 4. There is an underground tunnel that connects the Governor’s Mansion in Baton Rouge to LSU’s Tiger Stadium. This urban myth that is said to be true, was as a path for the Governor to travel underground. 5. Baton Rouge was the site of the only battle in the American Revolution that occurred outside the original 13 colonies. Never been to Baton Rouge? Here’s a few tips for traveling to the city. DeJean Noland Law Office is a law office located right in the heart of Baton Rouge, Louisiana. Need legal assistance? Call our office today!